Imagine living in a country where the trees drip with human blood. A country where dragons are out to roast you for dinner. And where lords invite you to dinner so they can massacre you. A country invaded by Viking sea-raiders from the west. They smash down your churches or set fire to them if you try to hide inside. And then Norman knights from the east arrive and build castles and churches (and kill a few peasants who get in their way). It's a country where gangs of murdering robbers attack you as you walk through their forests. A country where the punishment for stealing cattle is to have your arms cut off and the punishment for a servant who steals from her mistress is to be burned alive. Where is this hideously horrible place? Transylvania in the reign of Dracular? No. Germany in the fairy tales of the Brothers Grimm? The horrible country is … Wales! The GOOD news is the trees no longer drip with blood and the dragons have disappeared … probably killed off by knights in fireproof knickers. The Vikings have stopped raiding and you can steal as many cattle as you like without having your arms cut off. All those things happened in Wales's horrible history. 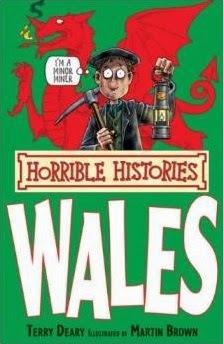 That is the introduction to the Horrible Histories Wales book. I wrote last week about making history fun. Horrible Histories is a great way to do that. It's not to everyone's taste, but it's working to make history accessible. With an introduction like that, most readers would want to know more, especially children. In a less crazy way, I'm hoping to do the same, mostly about medieval Wales. If the introduction above has piqued your interest, I've already written about where lords invite you to dinner so they can massacre you. and way back in 2010 I wrote about castle building. If you look around this blog, maybe you'll find other interesting bits of history.